You'll be making a splash in no time with this top-rated pool. The Ultra Frame Rectangular Pool Set comes with everything you need to set-up and maintain a large pool, and it can be assembled in one hour or less. It measures 24' x 12' ft x 52" which is the perfect size for families and friends to enjoy. Intex is a leader in above ground pools with models in various shapes and sizes. This rectangular metal frame pool set features laminated sidewalls and a metal frame that's able to hold 8,403 gallons of water. The set includes a 1,600 GPH Krystal clear sand filter pump & saltwater system to keep your water free of algae and bacteria. A ladder, ground cloth, pool cover, maintenance kit, and volleyball complete the set. Customers across the board love this attractive looking pool, saying it will save you a bundle compared to an in-ground pool or another premium above ground option. People who have upgraded to this model have also commented on the straightforward installation process. In the market for a new cover to use with your pool? Check out our favorite solar pool covers. Summer fun doesn’t have to cost a ton of money. Enjoy a budget swimming pool like the Intex 12’ x 30” Metal Frame Pool. This affordable option isn’t the biggest pool on our list, but it will help you make the most of the hot summer days. This 30-inch deep pool from Intex includes a filter with Hydro Aeration Technology for improved circulation and water quality. However, some people upgraded the pump to a more powerful model and recommend that others do the same. Before you upgrade your filter or pump, check out our list of the best pool filters. The pool itself lasts most people at least a couple of seasons, which is a great deal for the price. It’s not an especially deep pool, but according to users it’s deep enough to cool off on a hot summer day. It's also a safer size if you have small children who are just learning to swim. For an above ground pool that leaves nothing to be desired, opt for the sturdy Blue Wave Martinique Above Ground Pool. Unlike inflatable pools, this above ground pool features the stability of a more robust steel frame and a 7-inch metal top rail. 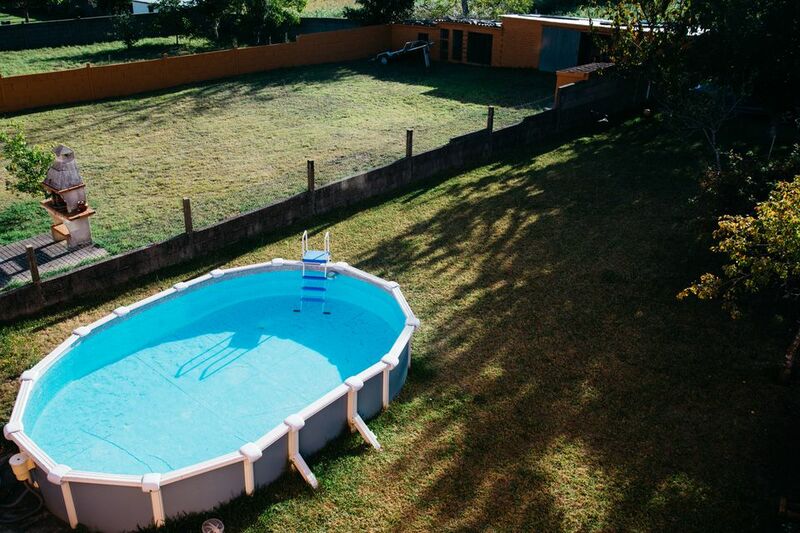 There’s nothing to puncture and this pool is made to last, as evidenced by the 25-year limited warranty. The Blue Wave Martinique holds 5,310 gallons and can fit up to eight people comfortably. To keep maintenance to a minimum, this above ground pool package ships with a sand filter system with 1 HP pump that users say works well to keep the water clear. While you can install this above ground pool yourself, user experience indicates that you’ll likely need three to four people to get the job done. Others opted for professional installation. Either way, once this pool is set up and filled with fresh water, you’ll be eager to jump right in and enjoy all this above ground pool has to offer for years to come. To keep your above ground pool looking clean throughout the summer months, make sure to invest in one of these top-rated pool cleaners. Best Kiddie Pool: Intex Crystal Blue Inflatable Pool, 45” x 10"
Give pint-sized swimmers a safe splash zone with a kiddie pool. For an easy-to-inflate and easy-to-empty mini pool, we recommend the frills-free Intex Crystal Blue Inflatable Pool. It's the perfect way to cool kids down on a hot summer day. At just 10 inches deep and almost 3 feet wide, this pool is designed with kids in mind—and it’s also a popular pick for a doggy pool, too! Inflate and fill with water for fun in the sun, then deflate for easy storage in a garage or outdoor shed. You can use a small air pump to get this pool set up in a hurry, or use lung power if you're feeling ambitious. A few people had an issue with at least one of the rings not holding air after some rough use—but for the price, if it lasts a season most users are satisfied. If you do develop a leak, you can patch the pool with the included patch kit. Reviewers say this pool is perfect for backyard fun or use it to cool off your pooch during the dog days of summer. For even more fun make sure to pick up a few of the best pool toys to keep your little ones entertained. Interested in reading more reviews? Take a look at our selection of the best kiddie pools. An inflatable pool is a convenient and affordable way to add a swimming pool to your backyard. These pools generally set up quickly and are easy to take down at the end of the season, with minimal parts and pieces. The Intex Inflatable Easy Set Swimming Pool combines all of these advantages for a pool you can start filling in 15 minutes. Intex’s inflatable swimming pool doesn’t require any tools, which is a big plus for cautious DIYers that don’t have a lot of tools or time. An instructional DVD gives you the step-by-step process you’ll need to get your pool up and ready for 3,736 gallons of water. A 1,000 GPH filter pump will keep the water clean while you splish and splash. It’s important that you smooth the bottom liner of any wrinkles before filling because customers found that not doing so leads to dirt accumulating on the bottom of the pool. The ladder also didn’t impress some users, who found it unstable. But in general, most people are pleased with the quick set-up of this inflatable pool and the easy enjoyment it provides. Go all in with an above ground pool that is sized for fun and equipped for season after season of use. The Intex Ultra Frame Rectangular Pool is a splurge that will have you swimming laps or playing endless water games all summer long. The Ultra Frame pool is supported by a strong and durable powder-coated steel frame. The Easy Lock System allows the supports to snap together without needing any tools; the entire pool can be set up in an hour according to the manufacturer but real-world use suggests it might take you a little longer. Fill it with 8,403 gallons of water for a super-sized splash zone that is ideal for larger families or hosting a pool party. Included with this premium above ground pool are a sand filter system and 2,100 GPH pump. The pool also features Intex’s Hydro Aeration technology for better circulation and clarity. People that have the Intex Ultra Frame Pool Set and saltwater system love how the water sparkles and rave about the savings in time and maintenance costs. A few people had issues with the liner having holes upon arrival, but this was remedied by the manufacturer. It should be noted, however, that the ladder and manual pool vacuum that come with the Ultra Frame pool set aren’t as high-end as the pool itself. People advise upgrading these two components for a better experience. Spend less time prepping and more time swimming with an easy-to-setup pool. The Intex Oval Frame Pool Set borrows features from the brand’s Easy Set pools and adds the stability and support of a modified frame to create a pool that is simple to set up and sturdy. At 18 feet long and 42 inches deep, adults and children alike enjoy this oval-shaped pool for pool games or swimming laps. Before you can jump right in, follow the manufacturer’s instructions for this easy set-up pool that can be assembled in about 30 minutes. One common warning from users is to make sure that you remove all the wrinkles from the liner before fully filling with 2,885 gallons of water. An included Krystal Clear cartridge filter pump will help keep the pool clean, along with regular maintenance. A few people encountered holes in the liner after use, but they were remedied with a quick patch job. This isn’t surprising since this easy set-up pool won’t last forever. However, most people enjoyed several seasons of use before this inflatable pool with frame needed replacing. Looking to stock up on pool supplies, but short on time? There are plenty of places to buy pool supplies that will ship to you for free! If you’re looking to go round and round all summer long, hop on a float and take it easy in the Bestway Power Steel Round Swimming Pool. Bestway is the parent company to well-known outdoor brand Coleman, and this well-rated round swimming pool has plenty of fans. Bestway’s round swimming pool set is equipped with a sturdy steel frame, pool cover, ladder, and 1,000 GPM Flowclear filter pool pump rated for use with up to 5,100 gallons of water. This pool holds 3,440 gallons of water, so the pump is a good match for the size. People found this round pool to be straightforward to set-up and easy to enjoy. A few people mentioned how the design of the included liner and lack of an inflatable top ring made this feel more like a “real” pool, rather than a temporary addition to the backyard. Still, this metal frame swimming pool requires minimal tools for assembly and disassembly, so it’s a snap to put up and take down with the change of seasons.